FMXD11 mixers efficiently mix from the top of a 55-gallon drum to the bottom, without requiring removal of the drum lid. The optional IPS drum bung adaptor allows fixed mounting of the mixer to the drum. Mixers draw approximately 14 gallons of liquid (750 cp max viscosity, 1.8 S.G. max density) per minute through the 2" diameter mixing tube. Fluid temperature range is 0 to 93°C (32 to 200°F). A shaft-mounted turbine inside the mixing tube rotates at 3450 RPM (from 300 to 3000 RPM for the air motor), creating a steady suction effect at the four upper intake ports. Liquid is forced down through the tube and forcefully expelled through the ports at the bottom of the tube, breaking up and dissolving settled particles (maximum solid size is 1⁄8"). FMXD11 mixers work with a non-vortexing, non-aerating action. The mixing tubes are just under 1 m (38") long. They have PTFE bearings at the center and base of the tube, and a graphite-filled PTFE seal. The shaft, turbine, mixing tube, and sleeve are 316 stainless steel. 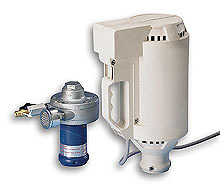 Mixers are available with either an air-driven or electric motor. The air-driven ¾ HP motor operates with 10 to 15 CFM air at 3.4 to 6.2 bar (50 to 90 psig), and includes a flow regulator and muffler. The TEFC electric ¼ HP motors are thermaloverload protected, and come with an on/off switch and a 3.6 m (12') three-wire cord with plug (FPUD421 supplied without plug). Use the air motor and the FMXD3-SK static protection kit for mixing flammable materials or in explosive environments. Use a filter/regulator and lubricator in the air supply line if the air is not filtered and lubricated.